The East End of the Pearl Street Mall is home to diverse businesses, unique shops and delicious dining options. The East End offers a one-of-a-kind experience to downtown Boulder, something you don’t want to miss out on. I wanted to highlight some of my favorite places on the East End, these awesome spots are surely some of downtown Boulders hidden gems! I like to start my day on the East End with a delicious sandwich for lunch from the Organic Sandwich Company. The menu is filled with local products like fresh produce, bread, kombucha, jam and honey. You seriously can’t go wrong with anything on their menu! After lunch I love to walk around and check out some of the amazing East End. One of my personal favorites is Buffalo Exchange, here you can buy, sell, and trade trendy vintage finds, and accessories for men and women. I could easily spend hours in Buffalo Exchange going through the racks and looking at the pieces they have! Some other great East End retailers I love to checkout are Chelsea, Common Era, and Violette! Once I’m done going through the racks at Buffalo Exchange I usually stop by Bliss or Momentum in search of unique trinkets and gifts! Bliss is a favorite of mine because they offer beautifully crafted gifts, funny greeting cards and lovely home decor. After I check out Bliss I love to pop into Momentum and check out their handcrafted fair trade goods. 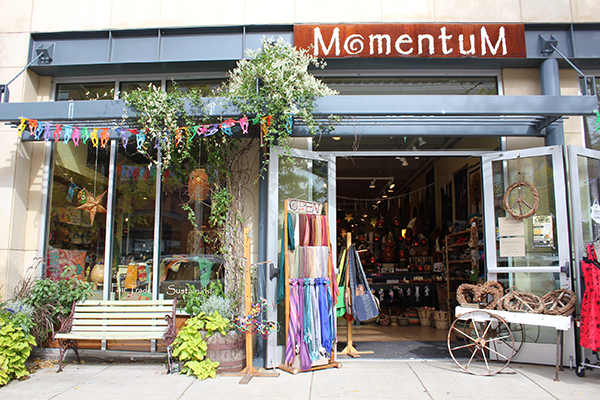 You won’t find another shop exactly like Momentum on the mall, each item they sell tells a different story from around the world. Before I grab dinner Art + Soul is always on my list. They recently moved into a new location next to Barbara & Company. The gallery offers contemporary fine art, unique crafts and elegant jewelry. I love the eclectic pieces of art that Art + Soul exhibits in their gallery, there is always something new and exciting to see! For dinner my go-to is an East End classic, Pizzeria Locale. This contemporary pizzeria is inspired by the traditional pizzeria’s of Napoli. Pizzeria Locale offers an amazing and energetic atmosphere. It is my favorite place to go with friends and enjoy delicious pizza and wine! I recommend trying the prosciutto and arugula pizza or the classic margherita! If you’re looking to check out a spot new to the East End head on over to Emmerson, a cafe, cocktail bar and neo-bistro all in one! I love their rigatoni cacio e pepe or if you are feeling adventurous try their oysters! You don’t want to miss out on their incredibly diverse menu, a great happy hour and delicious cuisine. For more information about the East End check out Warby Parker's East End Insiders Itinerary!